How can I use the Differential Function in PTW? 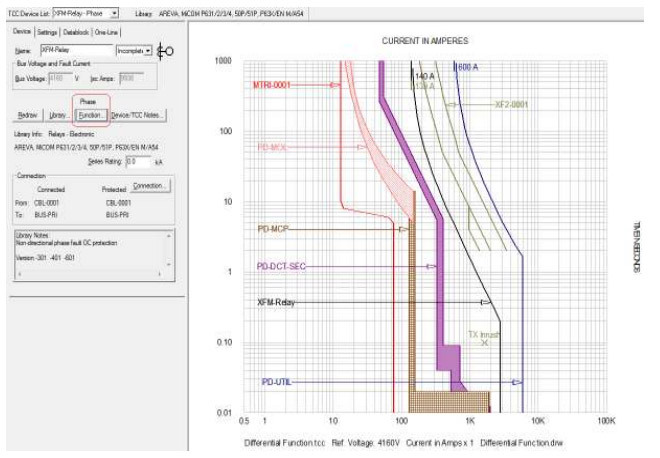 The Protective Device Function in PTW v6.5 has new features for modeling additional functions such as differential, that can be utilized in Arc Flash Evaluation. The following provides a brief description of implemented concept for the differential function, how it can be used, and how to apply it in a study. The differential function in PTW can subtract the SC current caused by a fault and passed through two protective devices modeled in the system. Since the actual CTs for sensing and the conversion of the fault currents are yet available, the two protective devices will act in place of the CTs and the program will internally account for the SC current conversion. The actual characteristics of the differential relay cannot currently be modeled in Captor. However, a generic TCC representing any adjustable pickup and delay can be used instead to represent the trip time for the fault. Based on the above, two protective devices are needed to be inserted into the electrical network to define the protected zone. Both device types needs to be set as Differential through the Function button in Captor or the Component Editor and linked to the library to represent the generic TCC of the device and protection zone. The following example will better describe the use and application of the differential function. Figures 1 and 2 represent a sample radial distribution system containing only the phase Over Current Type Function while Figure 3 displays the arc flash results for the secondary bus of the transformer, BUS-SEC, without any differential function. The following steps can be used to add a differential function to the existing overcurrent phase function of the XFM-Relay. This relay will be used as the reference for one of the CTs while the PD-DCT-SEC feeder breaker will be used as the other reference CT. Select the XFM-Relay device in the Captor TCC drawing (Figure 4) and click the Function button to display the Protection Functions. Click the New button and type in Differential under the Function Name column. 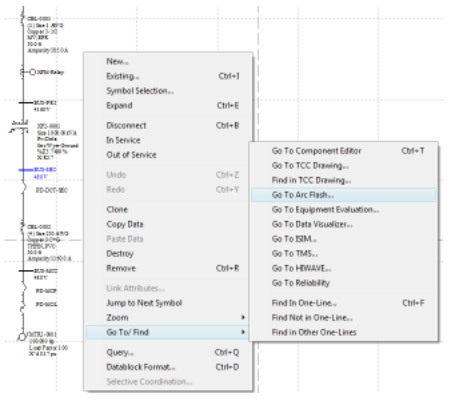 Select Differential from the Type pull-down menu (Figure 5). The window for "Differential of Current from Selected Devices" will prompt for the selection of the protective devices as the reference CTs. 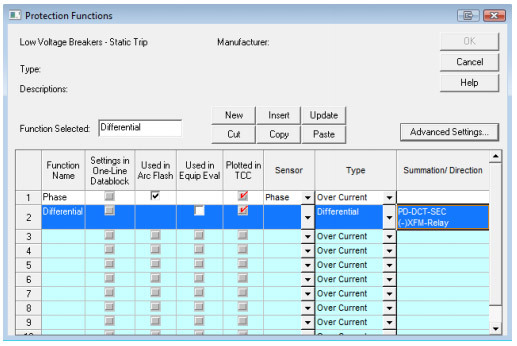 An additional option is provided to select these devices from the TCC associated one-line drawing or from all of the devices in the project (Figure 6). Select the XFM-Relay and PD-DCT-Sec devices by using the Ctrl Key+Left-click. 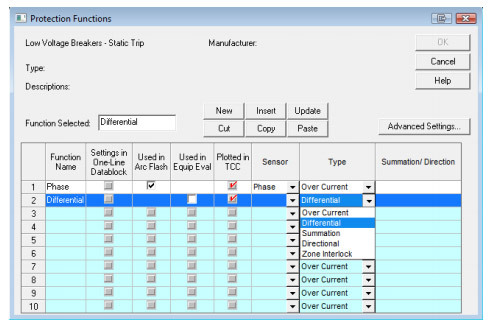 Click OK to have the referenced device currents subtracted and displayed under Summation/Direction column (Figure 6 and 7). 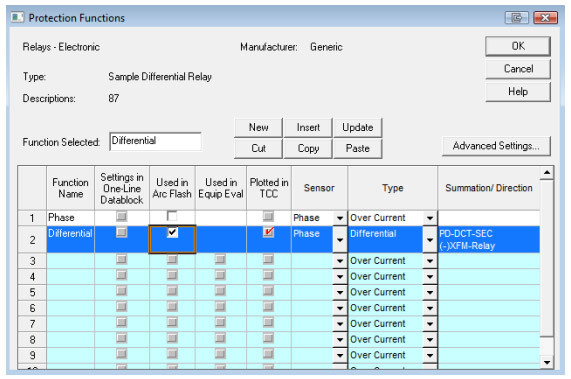 Note that the check box for "Used in Arc Flash" is not available for the newly created differential function because no TCC curve from the library is assigned to it at this point. Click OK to return to the Captor TCC screen to link this function to a model from the library. Once the differential is displayed on top of the Functions button, click the Library button to select a generic model for this differential function, similar to the device in Figure 8. Click Apply and Close to review the TCC of the new differential function in Captor. Note that the function names (Phase or Differential) are now added at the end of the XFM-Relay device name (Figure 9). Click the Function button again to confirm that the "Used in Arc Flash" is now available for the differential function as well. Check this box to use the differential function in Arc Flash. Note that the box in front of Phase is automatically unchecked (Figure 10). 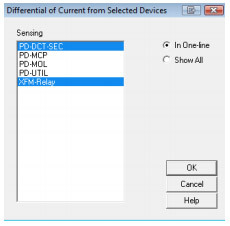 Now click OK.
Repeat steps 1 through 8 above for other devices (PD-DCT-SEC in our sample case) if the total isolation of the protected zone is required. Select the BUS_SEC from the one-line drawing. Right-click and choose Go To/Find > Go To Arc Flash to analyze the study results for the bus which is within the protection zone of differential relay (Figure 11). 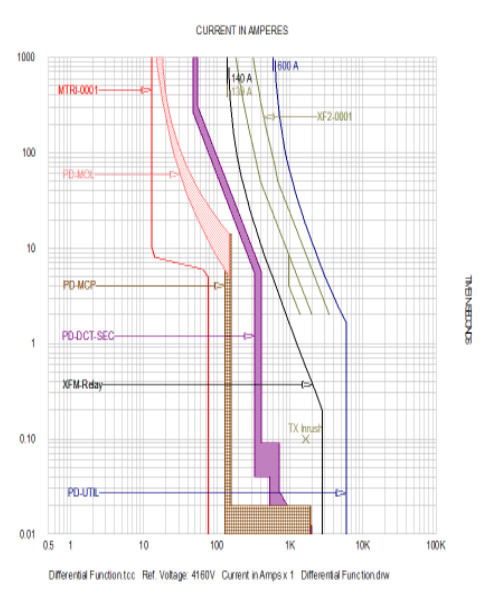 As shown in Figure 12, the incident energy and required PPE has been reduced due to the 0.05 sec trip time of the differential function set as this delay time. 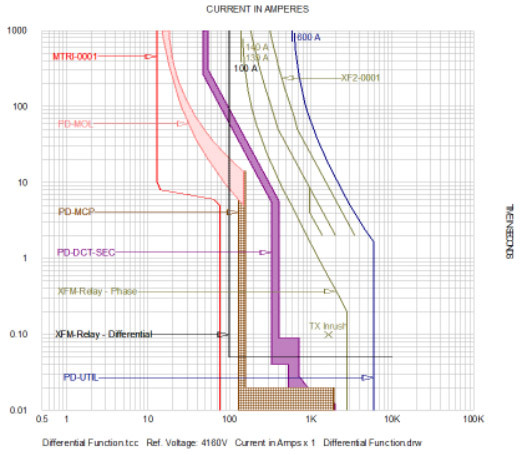 Note that in the sample case, the addition of the differential function to the other device (PD-DCT-SEC) will not change the arc flash study results for BUS-SEC. This is due to having a total of 0.083 sec (5 cycle) duration for the contribution of the motors that is less than total clearing time of other device (PD-DCTSEC Total Clearing Time = 0.05 + 0.083 = 0.135 sec).